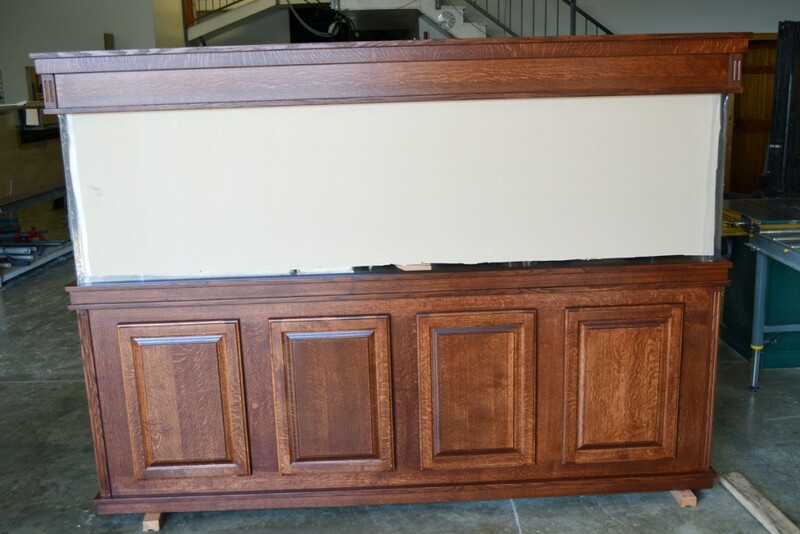 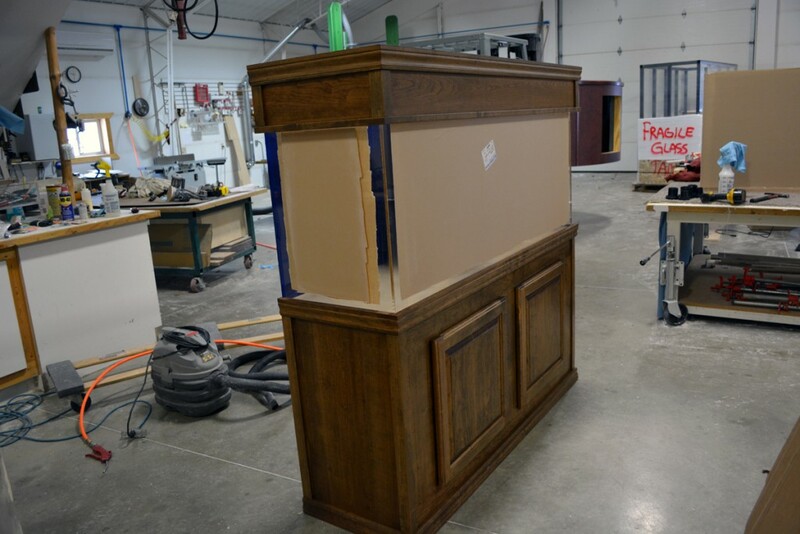 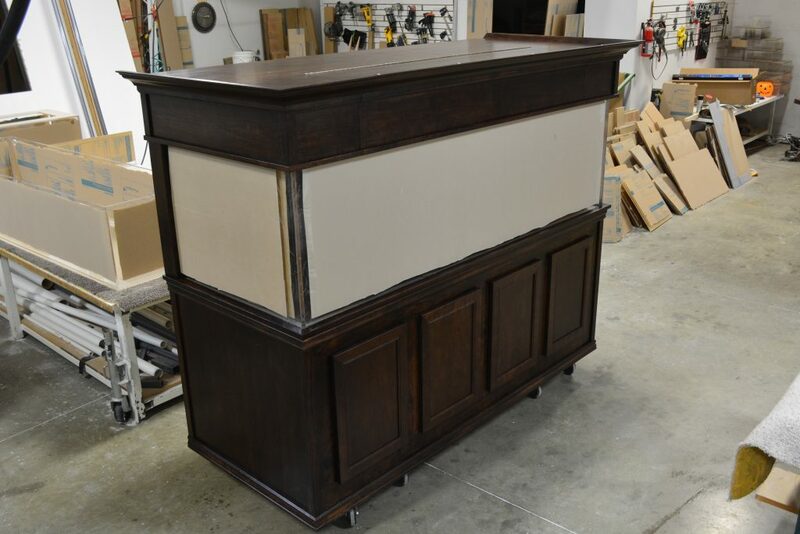 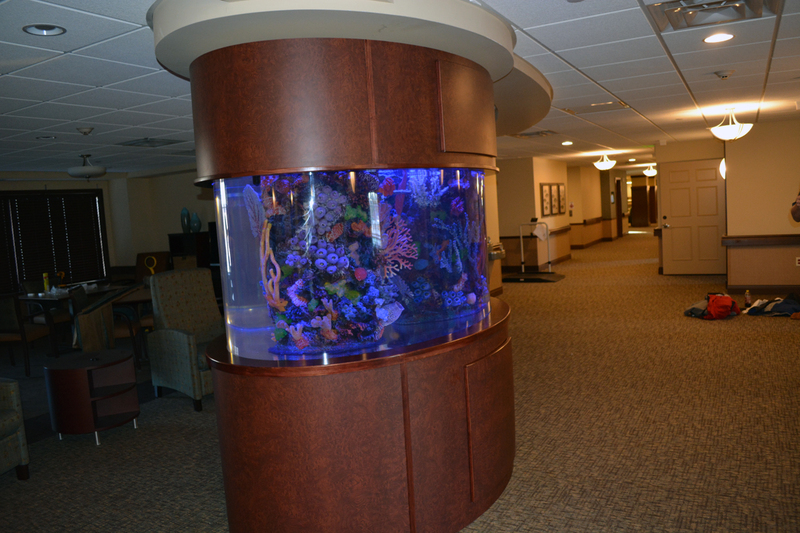 Midwest Custom Aquarium has been building custom cabinetry from the start and will supply a quality set that is guaranteed to work perfectly with your new tank. 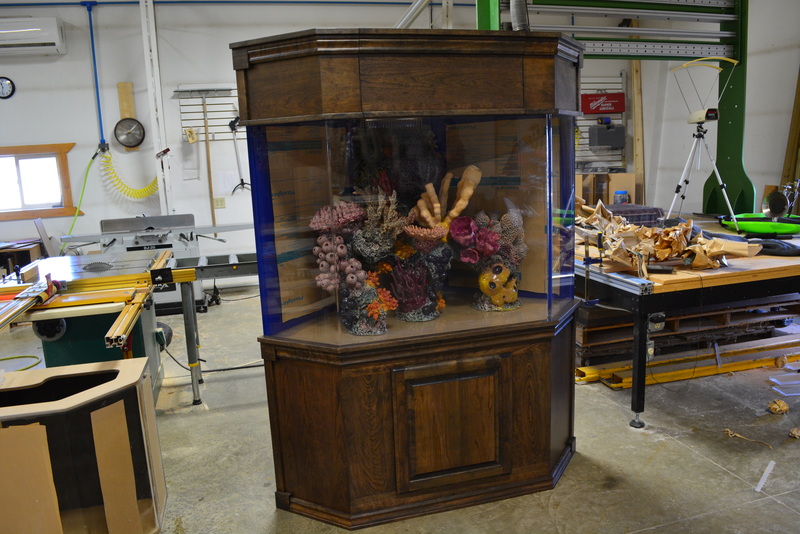 From a basic set to the finest furniture, we can put together a set that will work seamlessly with your new aquarium and match your existing style or décor. 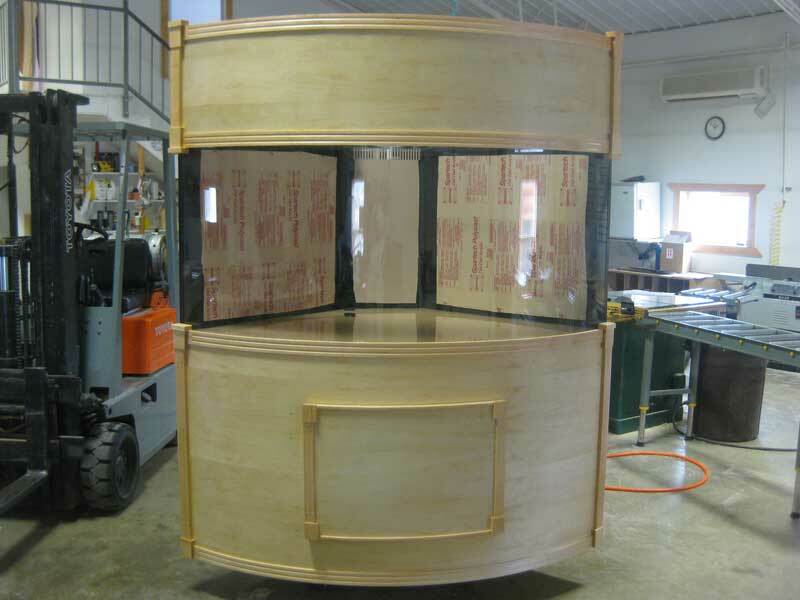 You will not have to worry about coordinating details with a separate contractor such as clearance size, no bracing under overflow, holes to line up with bulkheads coming through the bottom of the tank, overhangs, etc. 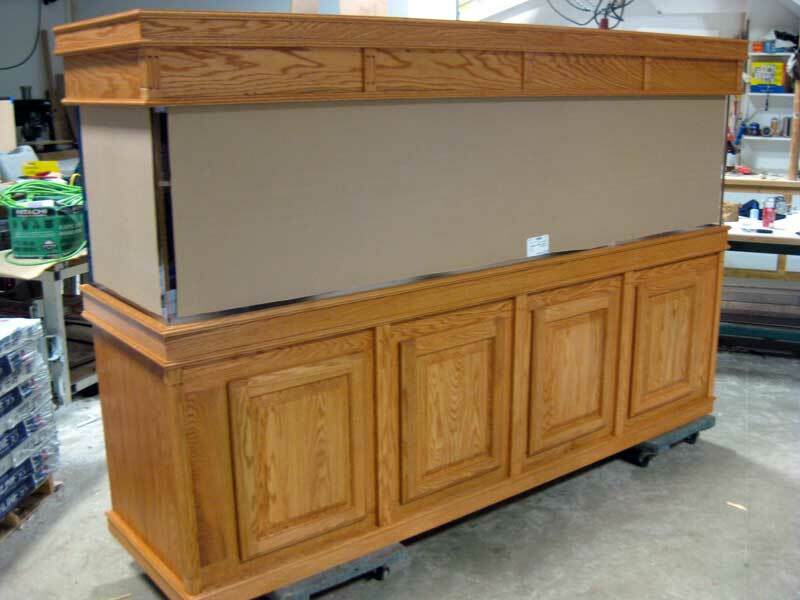 Getting your cabinetry from the same manufacturer reduces the chance of things not working with your tank. 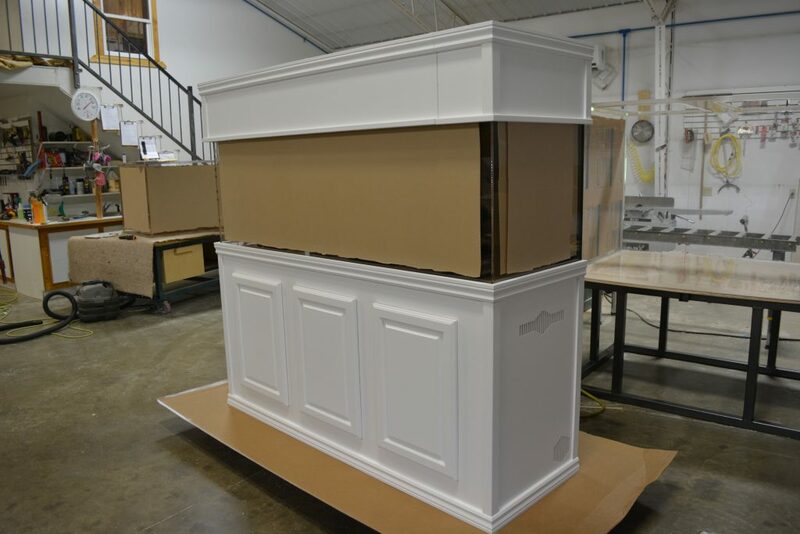 While come companies offer just a couple standard styles, we are proficient with enough mediums and styles to be able to offer almost anything. 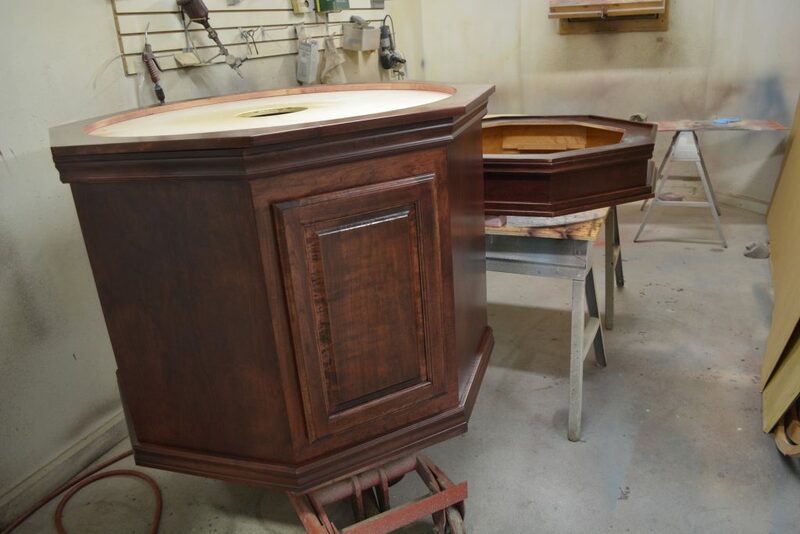 Nothing is kept on the shelf; all are built custom, one at a time. 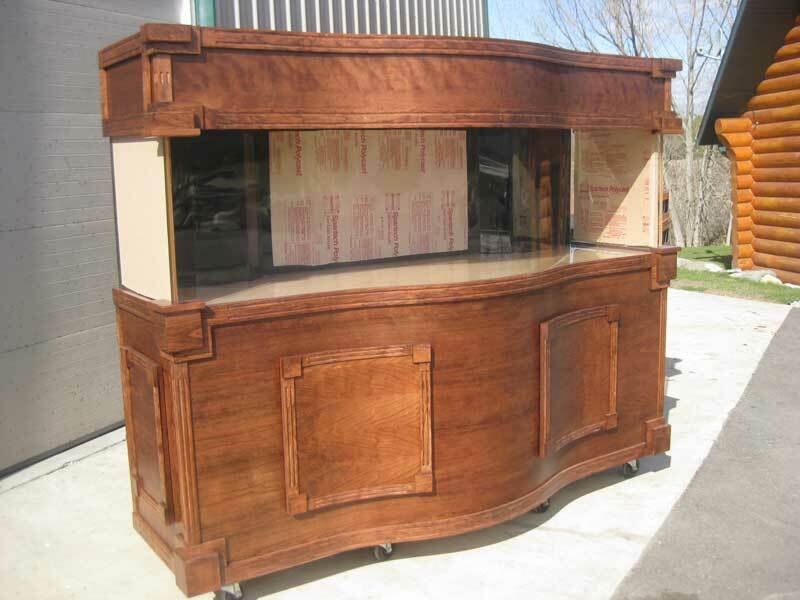 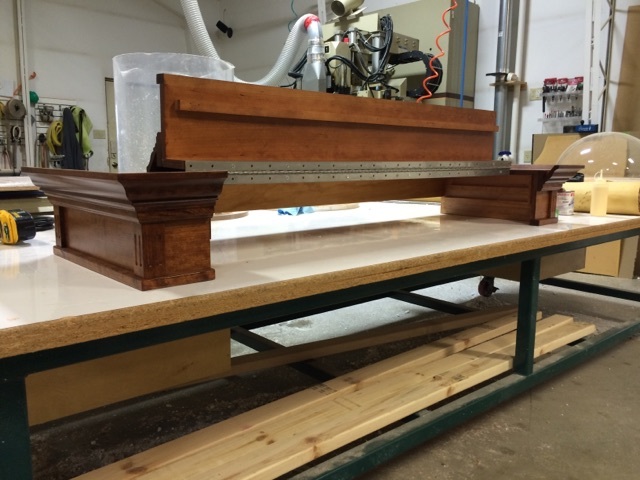 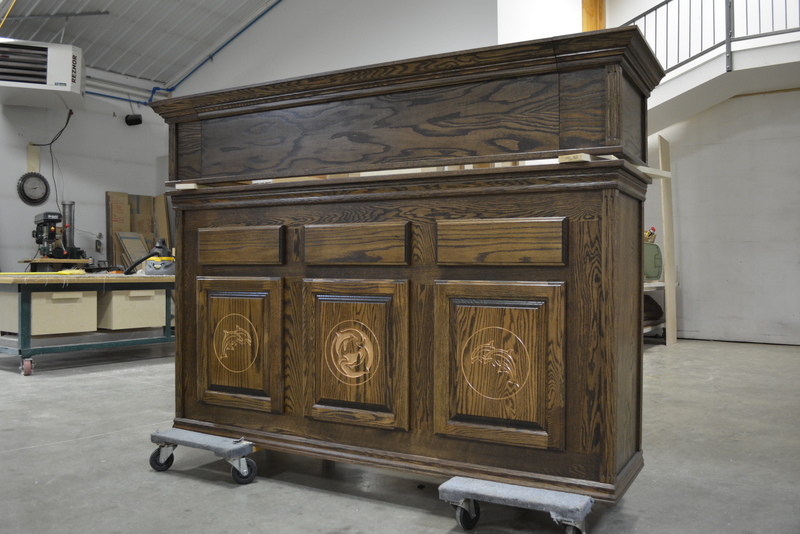 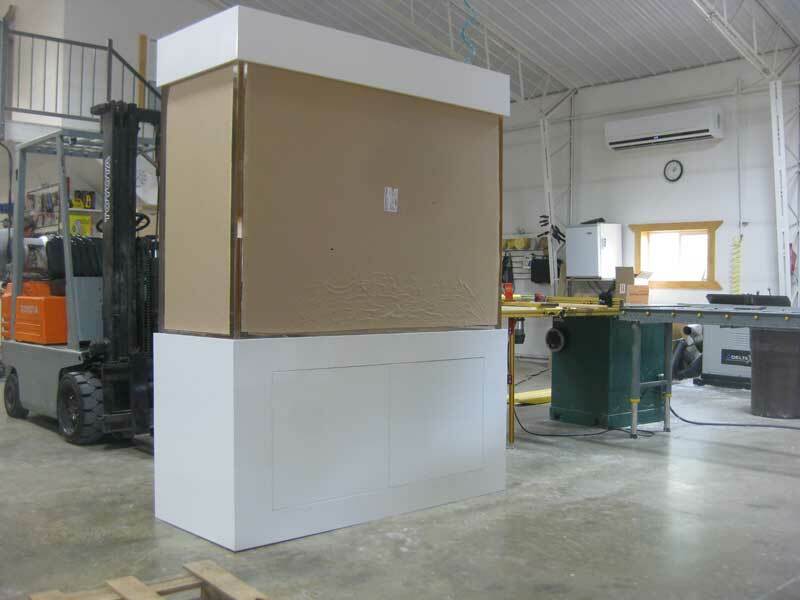 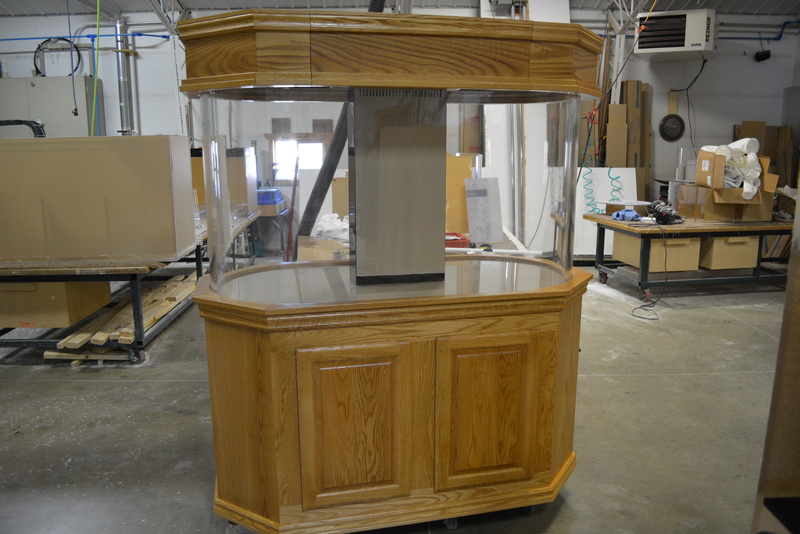 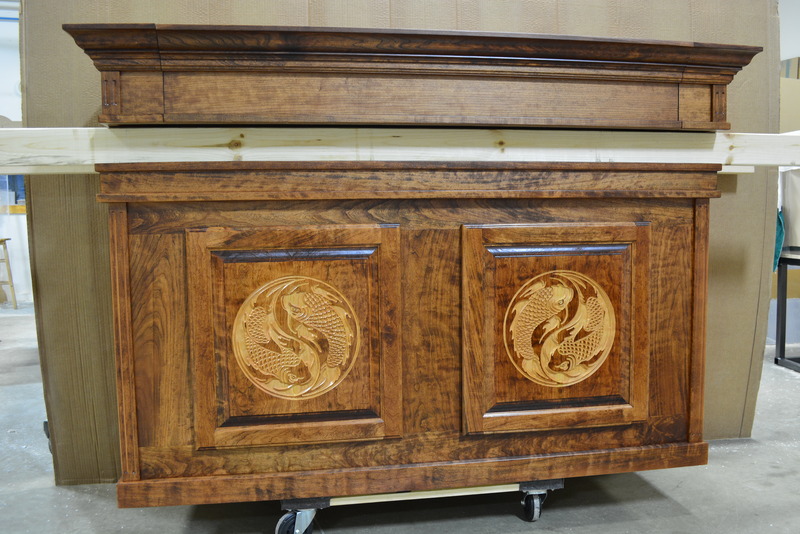 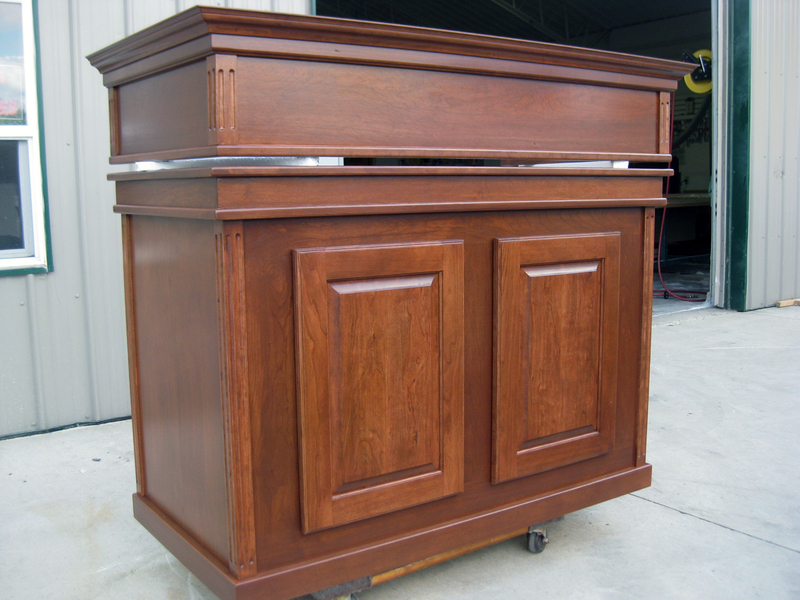 Matching odd shapes and curvatures can be difficult or impossible for some cabinetry shops; having them built by the same place as the tank insures a perfect fit. 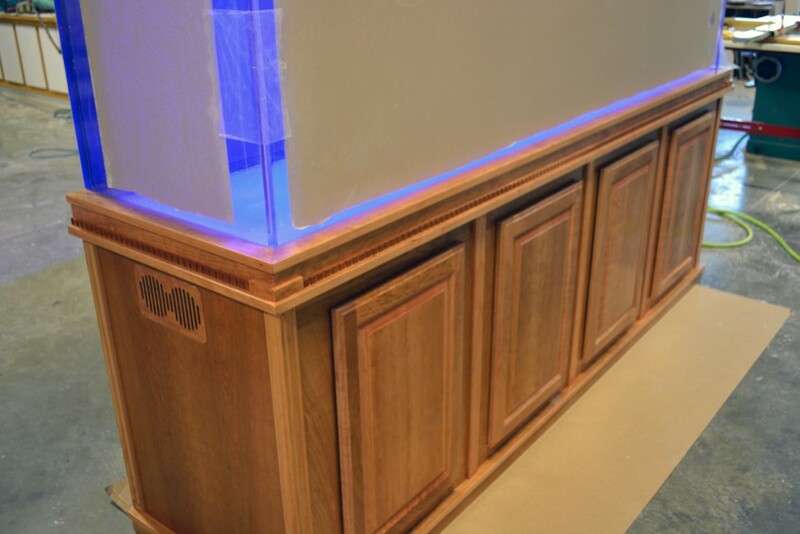 All are built strong enough so you have peace of mind that it will not buckle under the stress of a heavy aquarium. 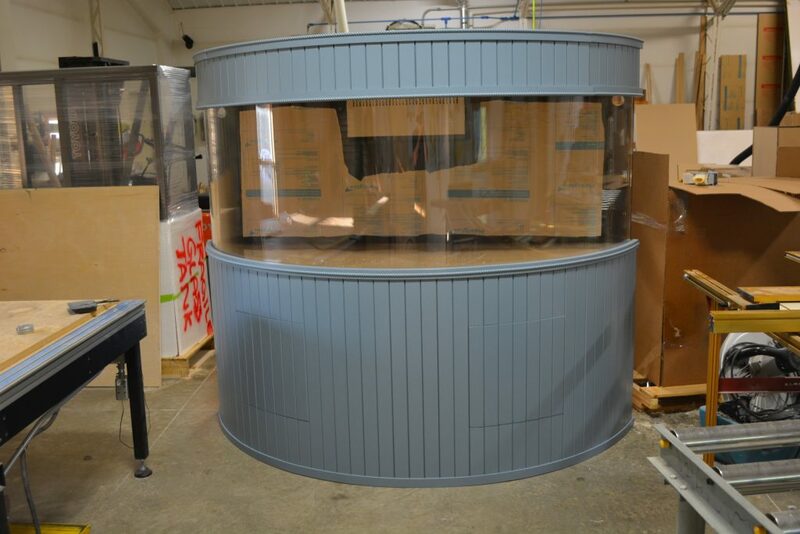 Stands seen from the front and sides are normally built with a removable brace on the back for installation of a large sump, trickle filter, etc. 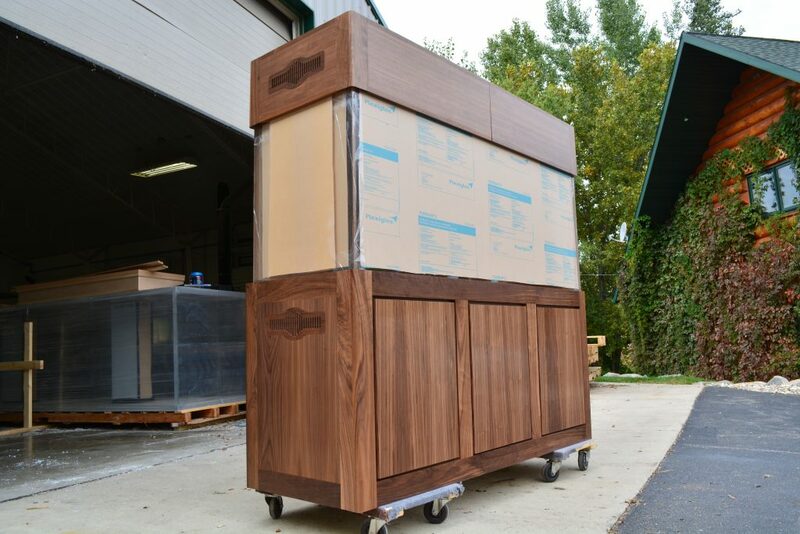 so you are not limited on the size of those items by the doors. 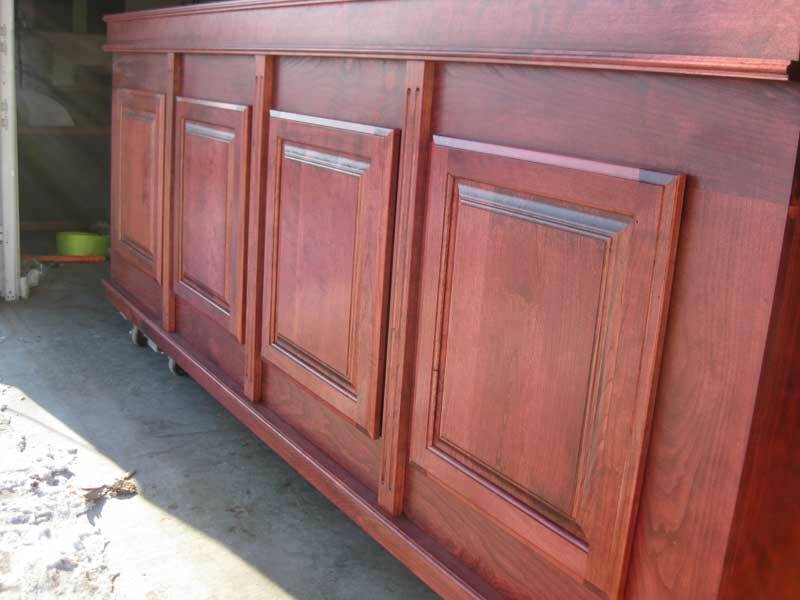 Available finished or ready-to-finish, all cabinetry is high quality. 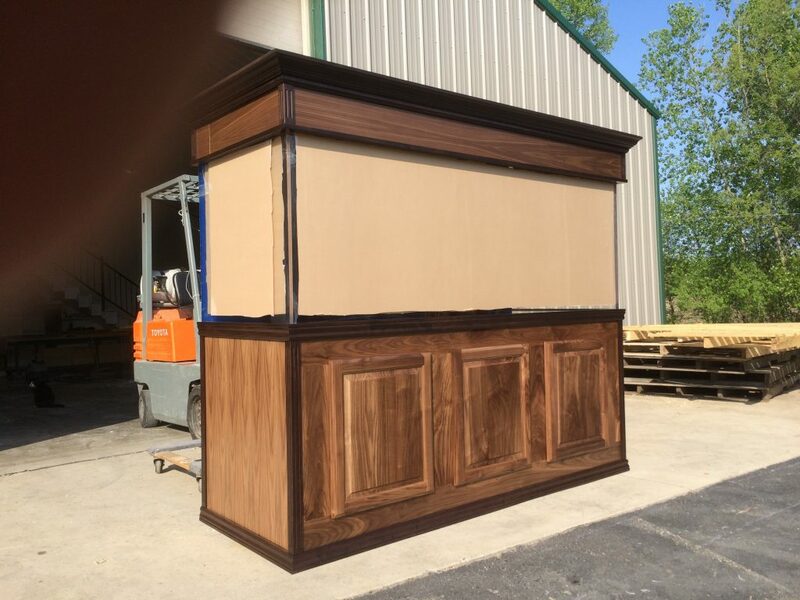 We do not use any particle boards, melamines, pressboards or fiberboards; all construction is with high quality solid woods, veneer core plywoods, and veneered laminates that will withstand the test of time. They will not be sagging after a year and will not swell with moisture as cabinetry made from cheap materials often will. 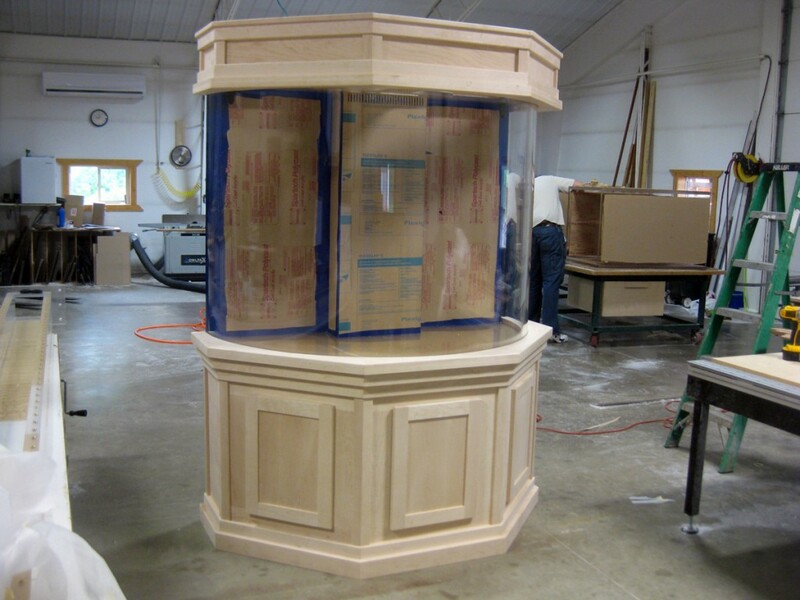 As with acrylic cabinetry, wooden cabinetry can also be laminated in plastic laminate to match any decor. 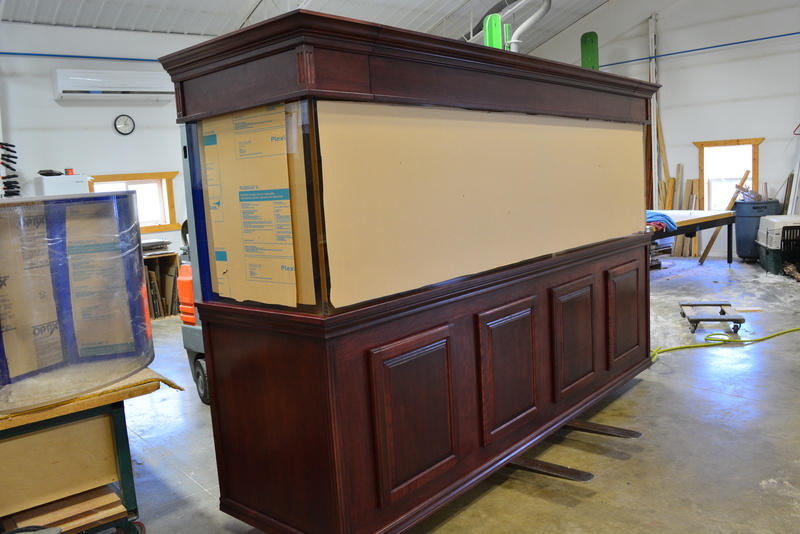 Cabinetry is finished to the customer’s taste. 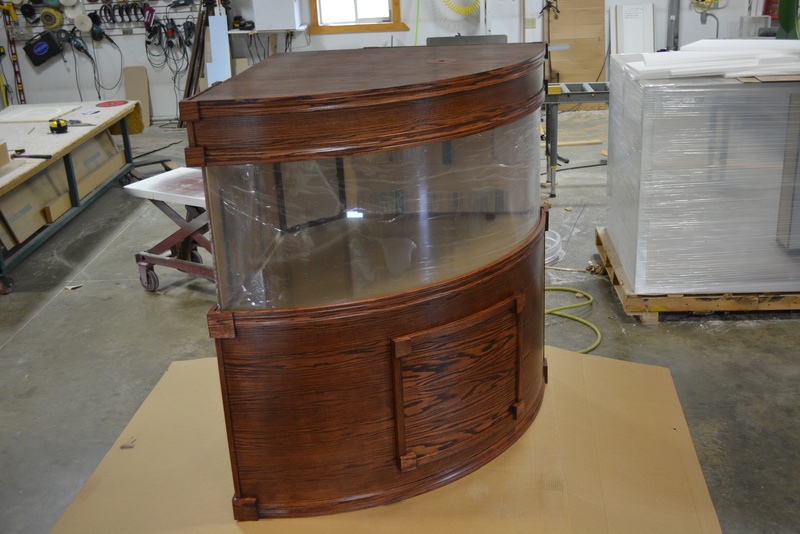 We prefer you send us the stain brand and color/number. 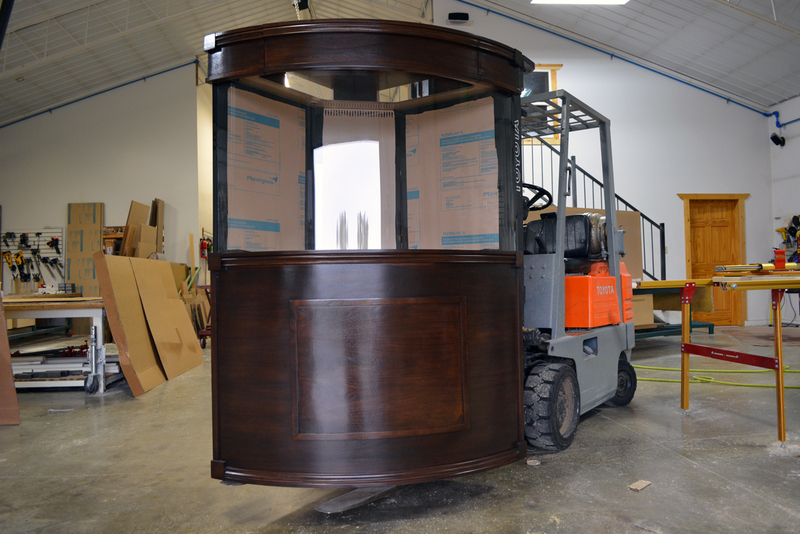 Then we can go out and pick up the same thing. 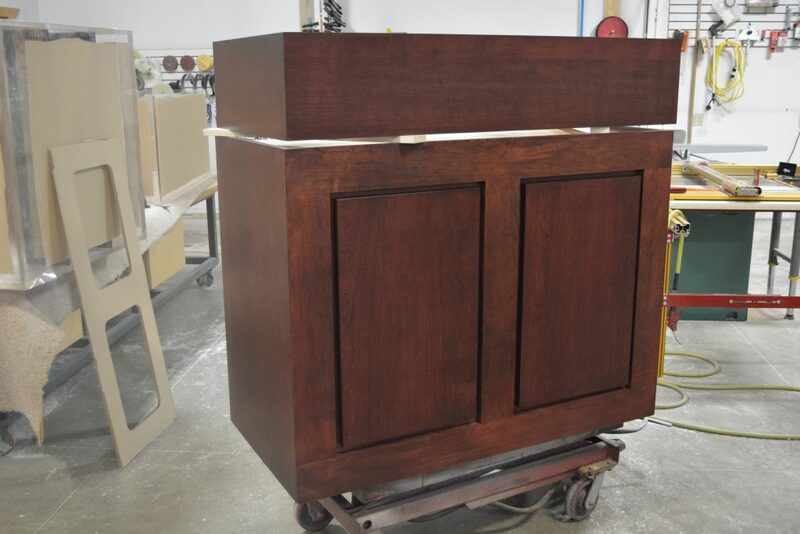 If ordering finished cabinetry, a high quality lacquer is sprayed on both inside and out for a durable, long lasting finish that is moisture resistant. 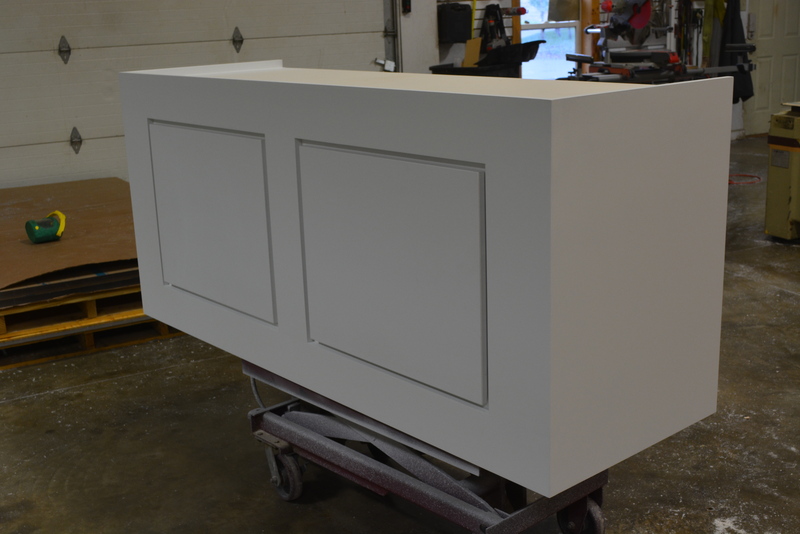 We also paint for some of the more modern tastes. 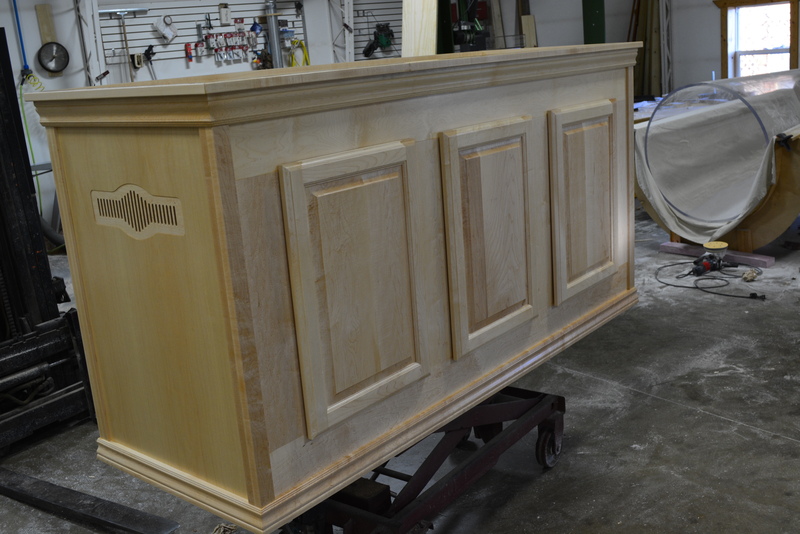 If finishing yourself, make sure that you seal the inside of the cabinetry as well as the outside. 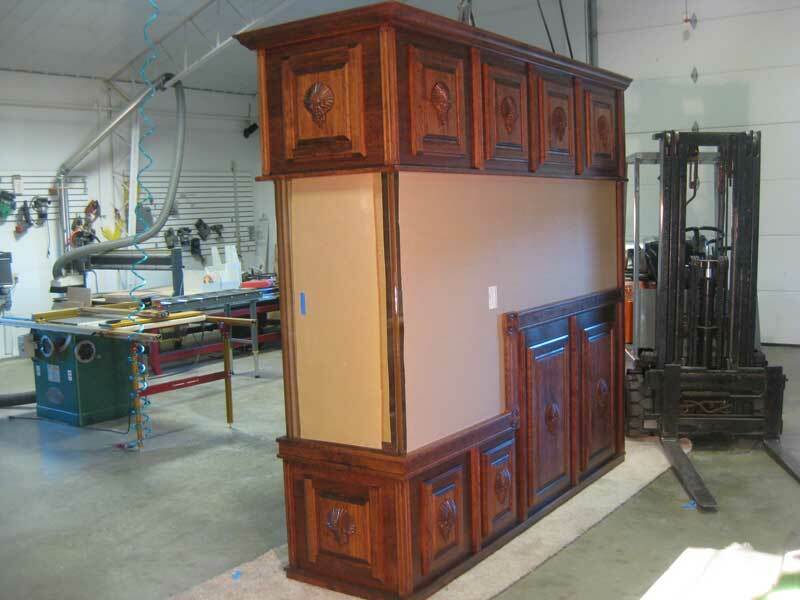 Larger cabinetry setups such as bookcases or wall unit installations are also available. 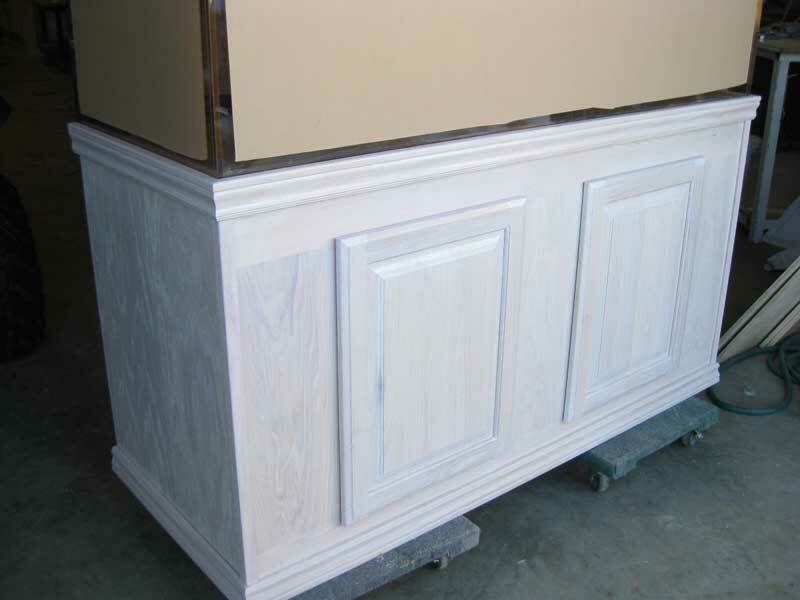 Options for wood cabinetry are limitless; give us a call with your request. 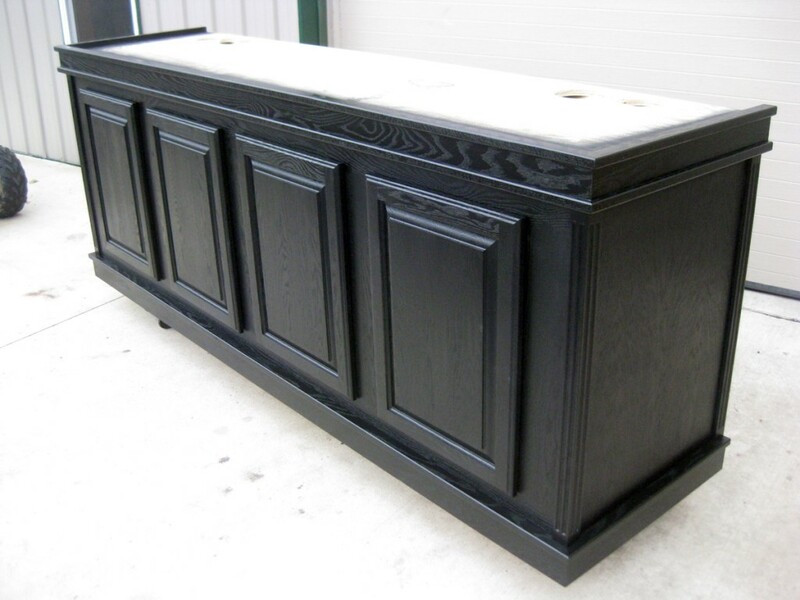 A variety of examples can be found below with a brief description. 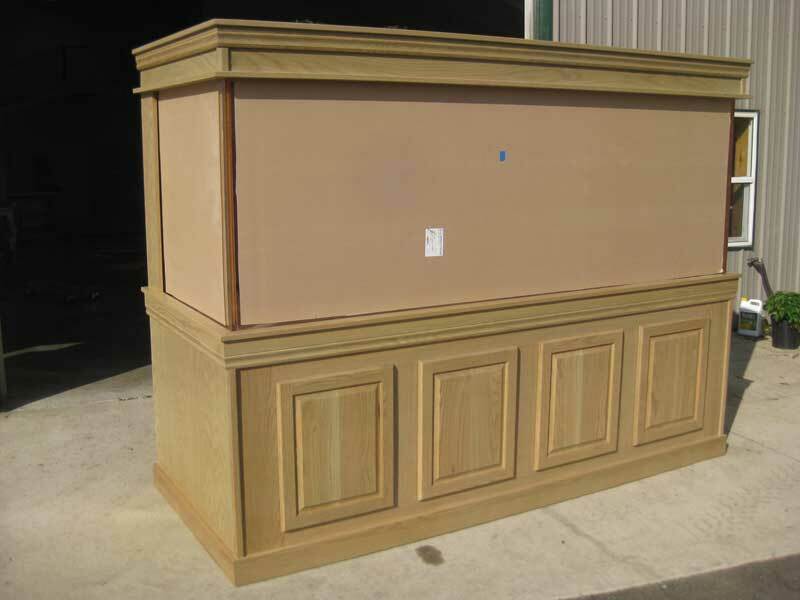 If you want a quote or are ordering cabinetry and see something similar to what you want, please copy and paste one of the following pictures into an email. 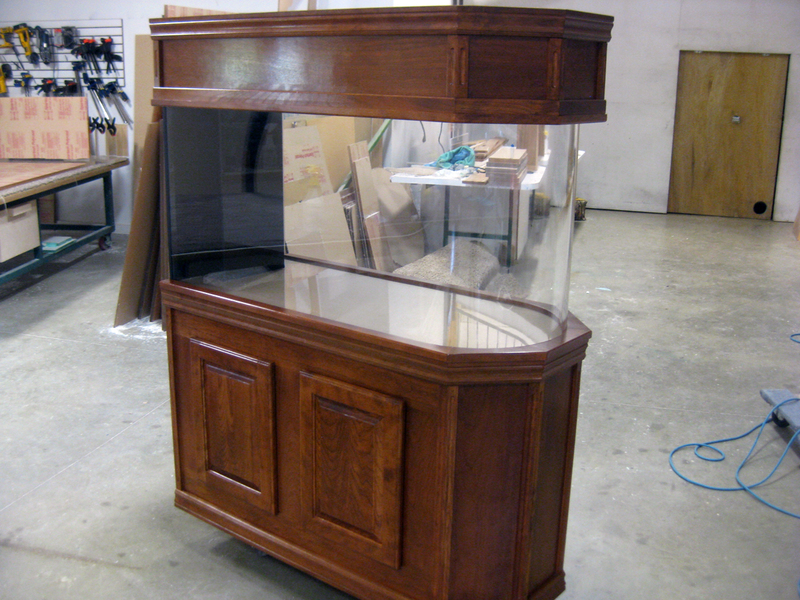 This will help us greatly in determining what you are looking for. 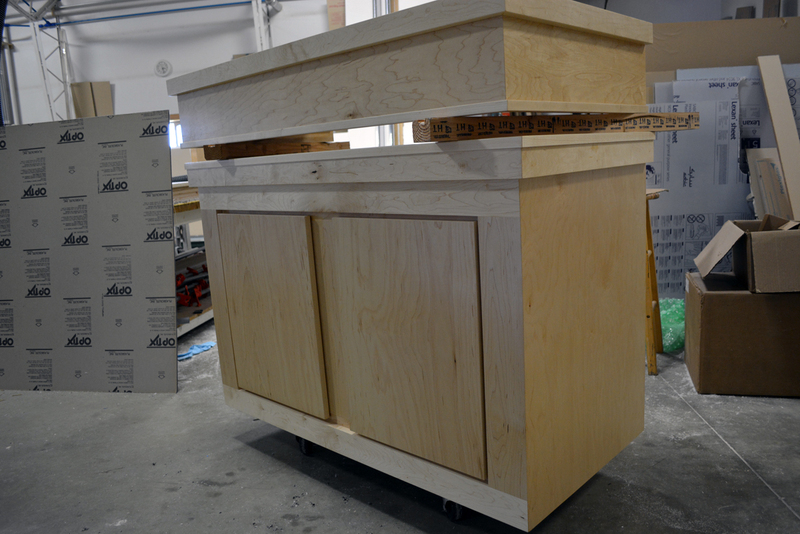 Nice finished cherry cabinetry for corner pentagon with flip front canopy. 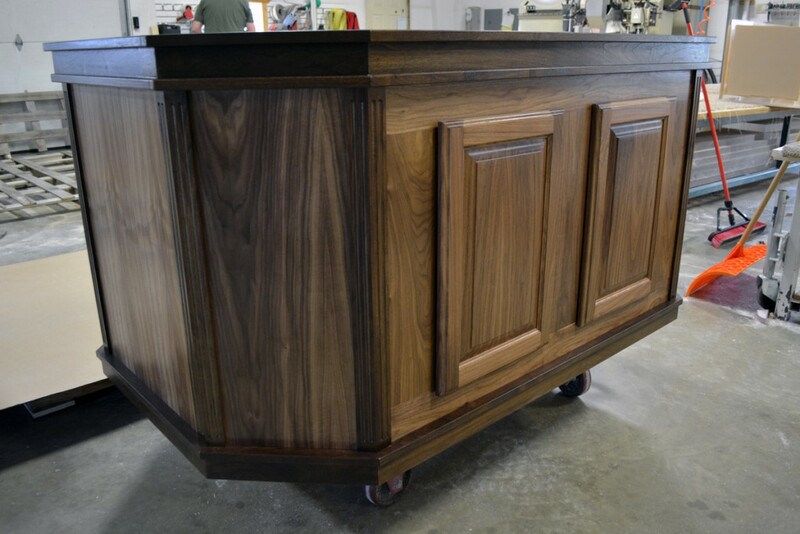 Stained black walnut cabinetry set for quarter cylinder. 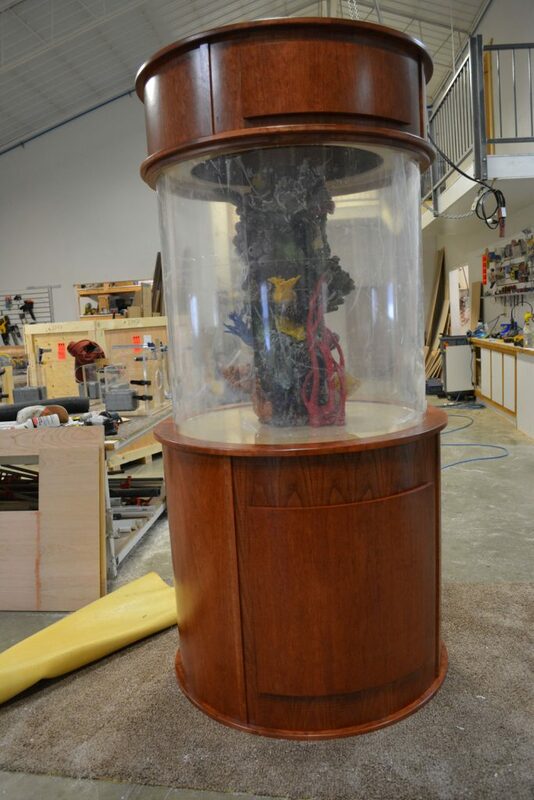 Middle of canopy flips up.